TURCK has announced the QF 5.5, ultra-thin 5.5mm capacitive proximity sensor that can be mounted in very small areas and solve applications previously impossible. The sensors also have an extremely long sensing range relative to their size: either 5mm or 10mm flush mountable range, depending on model. Mounting versatility is facilitated with several holes and slots in the sensors that allow multiple mounting options. The sensor comes standard with strap ties for use in mounting the sensor onto a sight glass or similar application. 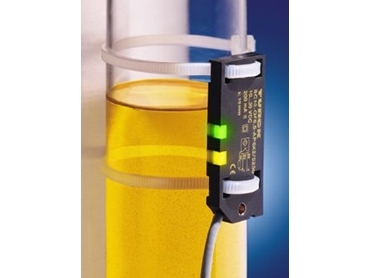 Turck capacitive sensors reliably detect all metallic and non-metallic materials, including water, metal, wood, glass, cardboard, plastic, concrete block, glue, thin wire, silicon wafers, and numerous other materials. The 10-30V dc sensors are embeddable in steel depending on sensitivity adjustment and are available with NPN (sourcing) or PNP (sinking), normally-open or normally-closed outputs. Sensit 1800 810 395.